In 1986, three teenagers were brutally murdered at 59 Oakwood Lane. The killer was never found. Over the next 40 years, as the murders go unsolved, the residence goes from rumour to legend. People are warned to never knock on the door. It's that house you cross the street to avoid. When this new group of teenagers decide to ignore that warning on Halloween night. They unleash a terrifying monster known as Never Knock who feeds on their fears. In 2017, it seems that the horror genre is trying to tell us that it's a bad idea to knock on doors to creepy abandoned houses. I believe that Neverknock would make a great double feature with Don't Knock Twice which was released earlier in the year. Both of these stories feature the same basic plot of knocking on the door of homes that have creepy urban legends surrounding them. By ignoring these, they unleash something far more terrifying than they could have ever imagined. Going into Neverknock, knowing that it was released as a TV Movie over on the Syfy network. I wasn't sure what to expect with this flick. The Syfy channel has a stigma about them. When it comes to the release schedule, they are well known for making these cheesy monster hybrid films. If you can think of some awful disaster and some apex predator, you can bet your bottom dollar that they have found a way to make it into a movie. Most of the time, they are pretty terrible. With Neverknock, they have gone and made a monster movie set on Halloween that is quite the gruesome romp. While a lot of their other films feel like they've got their tongues firmly placed in cheek. This latest watch feels like a straight-up horror film that delivers on the gory thrills and chills. While most of those Syfy hybrid monster movies do contain gore and violence. They come with this quality that some would describe as laughably cheesy. I'd even go as far to say that a couple of them are so bad they're good. What works in the film is that it captures that spirit of Halloween. Well as much as an Australian who has been to New York City twice during Halloween and three decades of movies that show what All Hallow's Eve is like on screen. I love seeing how the US celebrates that day. Being an Aussie, we don't celebrate it, and it makes me sad that we don't. I feel that Neverknock really does conjure up that sense of excitement over Halloween. That is until the monster that feeds on your fears comes to kill the group of teenagers who dare knock on the door. Another element that I enjoyed about the film was the creature design. The monster looks creepy here. When it's crawling on all fours as it stalks a victim through a hay bale maze to it walking on two legs and punching holes through teenage girls chests. I thought it looked really well done. The flesh of the creature appears like shiny black tar oozing. The fact that the eyes are on the side of its face like its got no symmetry makes it look even more disturbing. I believe that the design here was a lot better done than other monsters of the same ilk. While I don't think Neverknock is flat out scary. I think the movie does build enough tension and suspense during the fear-based attack scenes. As all of the teenager's fears grow, so does the monster and its savagery towards the group. The scenes of violence don't really hold back. I thought I was going to see some TV-rated gore and violence and this movie is pretty gruesome. There is enough death and carnage that made me gleefully happy. I also enjoyed the fact that the ending of the film is pretty dark. People who I thought would survive, don't. We also have the main character here who is coming into her sexuality, and I liked the fact that our lead was a lesbian as she had a crush on her friend. I enjoyed that the movie went to that place. I love seeing LGBT representation in horror. I like that this felt authentic. It didn't feel like she was some caricature. I think Jodelle Ferland really does the role justice. Ever since Silent Hill and Tideland, I've loved seeing her on screen. I think she has a long career ahead of her, even if it's just in the horror genre. She owns it. Lastly, if I have anything bad to say about Neverknock. I think my biggest issue with the film is some of the visual effects work. A scene towards the end when something is vanquished, it looks incredibly cheap. That is expected when you sit down to watch a Syfy movie, so I can't be too hard on it. We also have a few supporting characters that really grate here. I have never seen any of the other actors in other movies, so for all I know, these could be first-timers. So I don't want to be too hard on these actors. This may also fall back on the script. - A child cut's his hand on a door. - A woman burns alive in a fire. - A teenage girl is bitten on the neck by a monster. - Nails are pulled out of a little girls hand. - A teenage girl is strangled to death by a monster. - Groups of people are seen bleeding from their eyes. - A teenage girl is repeatedly pierced with metal rods. - A girl cuts her hand on a fence. - A girl is dragged off by a monster. - Never, never knock is carved into someone's back. - A snake wraps around a girls throat and breaks her neck. - A teenager is bitten on the hand by a monster. - A young boy and his older brother are killed in a creepy house. - A monster punches its fist through a teenage girl's back. 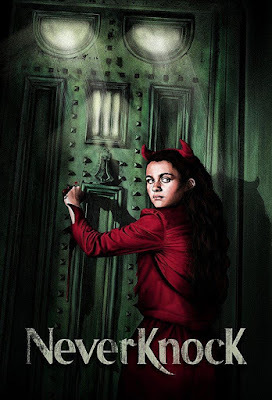 Neverknock is probably my favourite Syfy Original movie that I've seen to date. While I have fun with Sharknado, this felt like an actual attempt at making a serious horror film. I loved the small town Americana feel and the celebration of Halloween. I liked the creature design, the gore, and the lead performance from Jodelle Ferland. If you love movies set on All Hallow's Eve. Give this one a watch and have some fun. Pair it with Don't Knock Twice for a 'Don't Knock' double bill. I liked the plot for Neverknock, I just wish it had been expanded on a bit more (like was it only if it bled you, you'd be done for?). I did like the Amityville-esque lore of the door is the thing that made the house and in return the creature evil. As well as how it used the greatest fear of each victim against it. That was pretty cool. I probably would have given it a 2. I liked the gore and the plot, just couldn't really get into it enough to enjoy it. Never watched Wynonna Earp. Seen it on Netflix. Might have to add it to the very long list of shows I've currently got on the go. I think I didn't mind it not being expanded on just for the fact that I thought this was so much better than a vast majority of the crap that Syfy makes that I gave it a pass for a few of the plot issues.